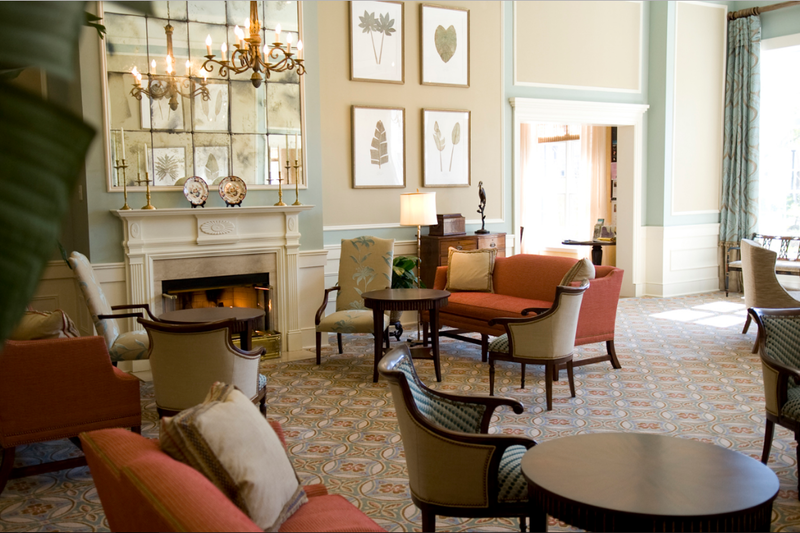 French country decor has never failed to impress every guest who drops by. Thathas made this interior design become more and more popular among homeowners. But, what is French country style? And what makes a home denote French country style? When you hear French country style, what pops into your head? Is it elegance, lush look, or classic? They are all the typical features of this style. Here are some significant features of French country style that are commonly found in houses adopting this style. French country decor usually shows rustic yet elegant look. Therefore, to create this style into your house, you need to consider the colors, furniture, lightings, and accessories. 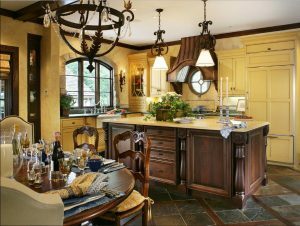 All interior designs have their own color schemes as a part of their special features, and so does French country style. The decorations of this style use a vast array of colors, from the soothing soft gold to the vibrant fiery red. Some other colors include cheerful yellow, light and dark green, cobalt blue, aquamarine, or any other colors denoting elegance. Looking elegant in natural way is the key point of French country decor. Therefore, rough stained or painted plaster walls are usually more preferable. However, some homeowners also use wainscoting panels covering the whole parts of the walls ── from the lower parts to the ceilings. Hefty beamed ceilings and walls are the things that you cannot miss since they are quite conspicuous. Woven rush sofas and wooden chairs that are either roughly finished or dedicately carved add the natural and elegant look despite being simple. Do not forget the stone fireplace since it is the focal point of a French country house. The key point of French country is the rustic look. You do not have to burn a hole in your pocket to create the rustic feel. You only need to find a seemingly old furniture such as distressed metals and wrought irons. Low gloss wooden chair and distressed will accentuate the rustic look. Another must-have item for French country style is Toile white or beige fabric with some patterns printed in red or blue. Toile is usually found in sofas. If you are really into elegant look or want to refurbish your house and turn it into French country style, here are 15 incredible French country decor ideas. Living room is the place in which you gatherwith your family or friends while shooting the breeze. Thus, creating an inviting and impressive living room is a must. When it comes to impressivelook, French country decor will be your best bet. 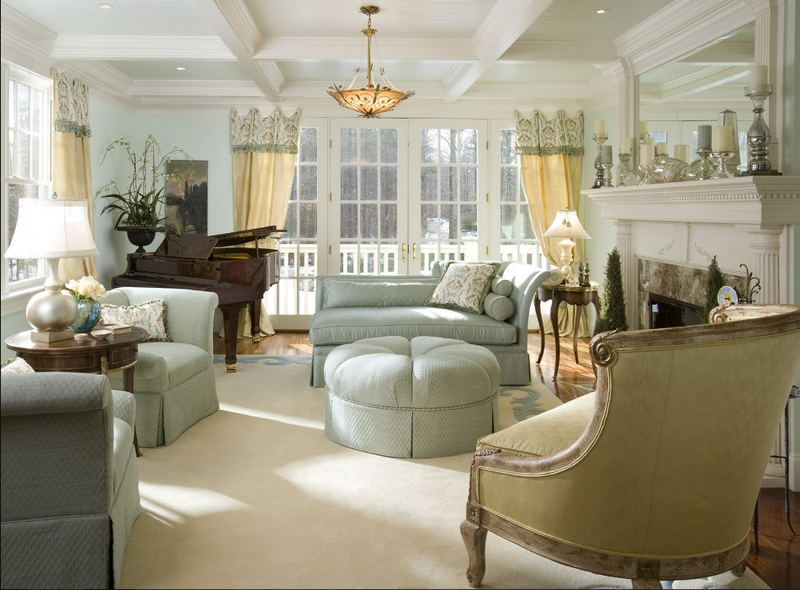 This living room harness the elegance of huge fabric sofas to embody the French country style. In addition tothose grey sofas, a beige fabric rustic-looking chair perfects the style a lot. French country style will not be impeccable without fireplace. Therefore, an LED showing the fire is installed in place of a fireplace. Well, it does in a pinch. Toile also plays an important role of this style here. Although it is not used as sofas, it still looks pretty on rhe curtains. To perfect the style, antiques such as lamps and chandeliers are added. 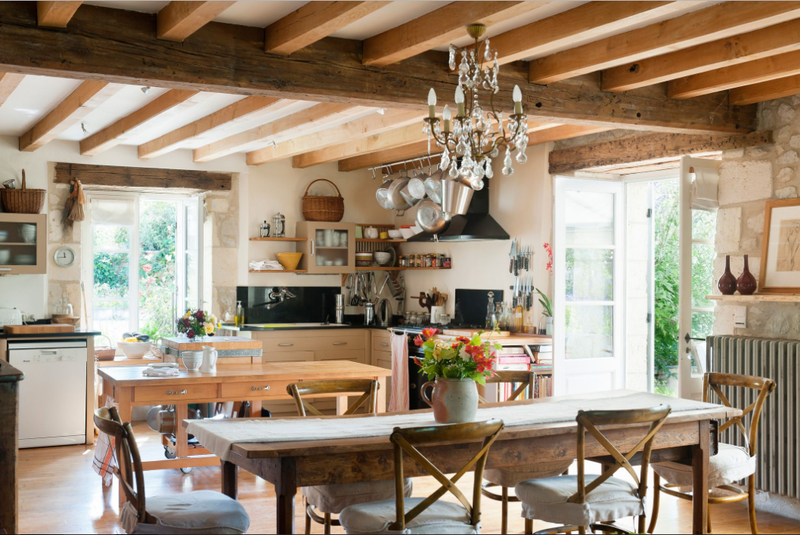 The moment you come into this kitchen, you will feel French country ambiance from the meticulous decorations. Let’s begin with the conspicuous dining table made of roughly finished woods creating the rustic look. The woven rush seats are really the icing on the cake. The flower sits nicely in the middle of dining table. You will not miss the conspicuous ceiling, thanks to the hefty beams that accentuate the plain ceiling, making it look classic. Talking about classic, nothing can beat the crystal lamp hanging right above the table. Two doors make good ventilations. The lamp creates romantic ambience. The lamp can be a bit pricey. Kitchen, for some people, is a place in which people find a number of brilliant ideas, especially cooking ideas. Thus, refurbishing your kitchen is necessary so that you can get more ideas. Let’s try French country style, shall we? Let the bricks be exposed. The unfinished walls can provide a distinctive charm to your kitchen as the exposed bricks give natural patterns to the wall. 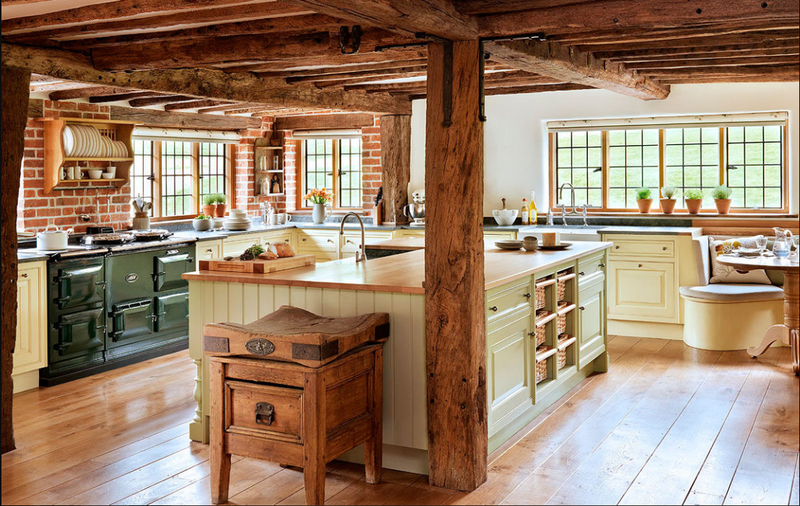 For the rustic touch, hefty distressed beams really do a great job, making the kitchen seem so old-world style. The rustic chest standing right next to the countertop perfects the style well. What an inviting dining room! French country style permeates throughout the room nicely. Everything seems so classic and elegant. The rustic dining table and chairs are the focal point of this room. The table was fastidiously carved to accent the classic look. Thecolor of woven rush chair seat adorned with toile gives a well-worn look that emphasizes the Frenchcountry style. The wooden cabinets are meticulously carved and painted dark and light brown, making them look like antiques. For the finishing touch, some old paintings are hung on the wall along with two mirrors. I like the frame of the mirrors, they are thoroughly carved and the copper finish makes it more conspicuous. To make it perfect, ceramic dishes make good accessories. 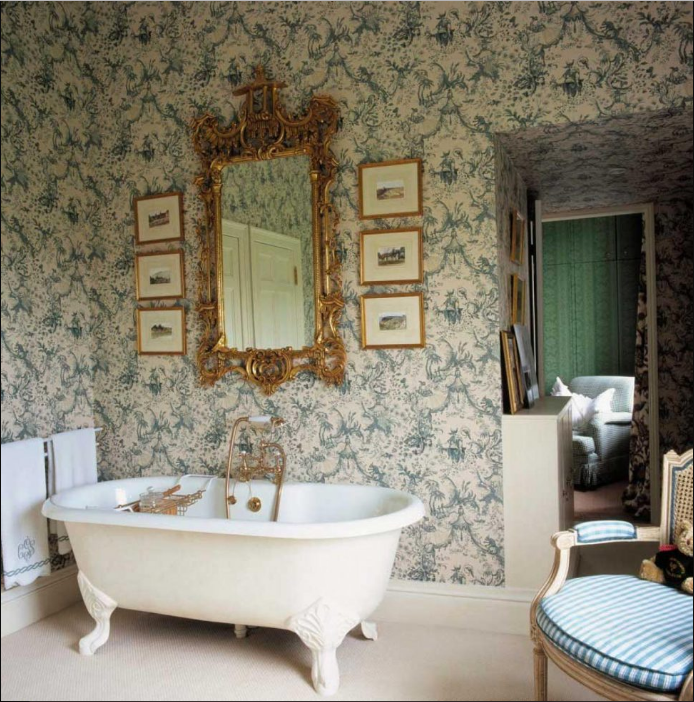 Invigorate yourself by implementing French country style in your bathroom. To begin with, hang toile wallpaper. Having your wall covered with toile wallpaper is the most convenient way to adopt this style even if you do not add some other adornments. To kick the French country style up a notch, copper-finished faucet and mirror frame are added. They definitely provide elegant look instantly. Adding some photographs can be a great idea to add a little bit of vintage style. The wallpaper makes your bathroom look eminently impressive. The wallpaper will be damaged easily due to the splashes and moistness. Thus, you will have to replace it regularly which can be a costly refurbishment. Unlike most interior designs using French country style, thisbedroomremainssimpleyet comfortable and elegant. Fewer decorations are used so that the bedroom is not overwhelmed by sophisticated furniture. The ambiance of French country style is represented by the toile pillows and bed cover very well. They combine yellow background with beautiful grey flower patterns. Two bird cages are standing on a rustic table and drawers. They are not used to keep birds, they mean to be decorative. The antique desk lamps accentuate the bedroom a lot. Do you want to invest French country style, but limited space is your real nightmare? Don’t worry! You can still have romantic and nostalgic ambiance although you are dealing with small space. Playing with colors is your best bet. 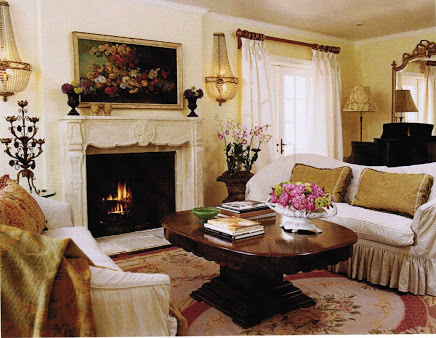 French country style tends touse bright yellow to brighten the room up. If you think bright yellow is too much, you can always use soft-butter color. It will be a great canvas for any additional colors. Dark brown can also be a perfect adornment to any colors. Natural stone flooring is more preferable in French country style just like what you can see in this kitchen. To make it look natural, this kitchen uses terracotta stone flooring. The natural patterns make the cramped kitchen look more beautiful. French country style works with any rooms well despite the size. This huge living room looks inviting with the classic of French country style. The elegant look begins with the soft beige walls which are accentuated with mint color. Some simple pictures about nature are hung beautifully on the beige wall. The exquisite pattern of the floor complements the fabric sofas and woven rush chairs very well. For a better French country style look, a fireplace is necessary. The combination of the fireplace and the soft colors provides warm ambiance when gathering with your family. For the finishing touch, chandeliers and antique lamps can be used rather than LED lightings. Monochromatic colors are always synonymous with the simplicity of modern and minimalist look. Why don’t you fuse modern style with French country style? The idea of modern style is “Less is More”, thus black, white, and brown are more preferable. When combining with French country style, the colors remain simple, but some patterns like carved woods are included. Another feature denoting French country decor is the black fabric sofas and coffee table. The walls are covered with flat wainscoting panels that have been meticulously carved. To add luxury in this living room, an astronomical crystal lamp is hung above the coffee table, making it the most conspicuous thing in the room. The black, white colors, and the huge lamp make the living room have a lush look. An astronomical lamp can burn a hole in your pocket. French country style is not only for interior design, but also exterior. 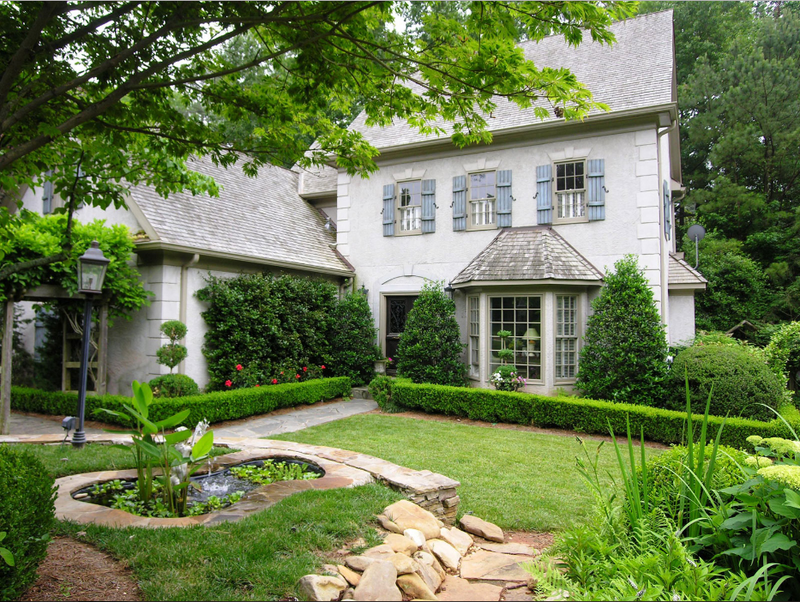 Impress your neighbors and passers-by with a top-notch French country exterior. Since we are talking about French countrystyle, we are dealing with natural and rustic look. To make it happen, neutral clay roof tiles are used. They provide an ancient look to the house. Three tall rectangular windows are set in row which enable you to look through them easily, but that is not the point. Making your house look classy is the point. Color palettes play a crucial role in creating the well-worn look. Either red brick or natural stone can be a terrific idea. Grey and white can also work well and complement the natural look of its surroundings. Add a romantic ambiance to your house’s exterior by adding French country balcony. The concept is just the same rustic yet elegant. Since it is usually a small mounted area in which you enjoy the landscape of your surroundings, you do not have many things to do with the decorations. It is impossible to cram fabric sofas or distressed wooden cupboard, isn’t it? 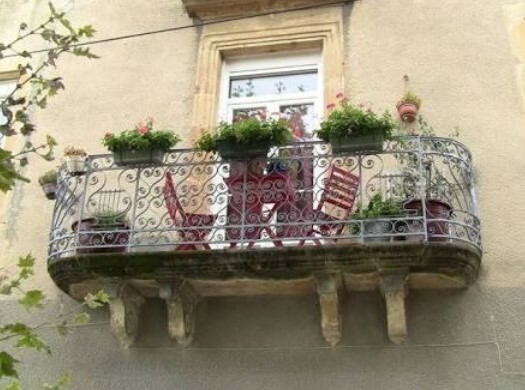 Thus, the focus of French country balcony is the railings. Wrought iron railings with curved ornamental design. Sometimes, to add the natural look, homeowners add beautiful planters with pretty flowers on the balcony while some others grow climbing plants that grow through the railings, making them look like “living fences”. Bring the relaxed ambiance in your patio with French country decor. Featuring natural stones with their neutral beige colors, this patio will be a great place to invite your friends or colleagues and make them impressed. The rustic look is resembled by the well-worn dining table. To achieve this look, you can shop it in a thrift store or just make one from distressed woods. Instead of wooden chair, this patio uses wire cages topping up with woven rush seat. 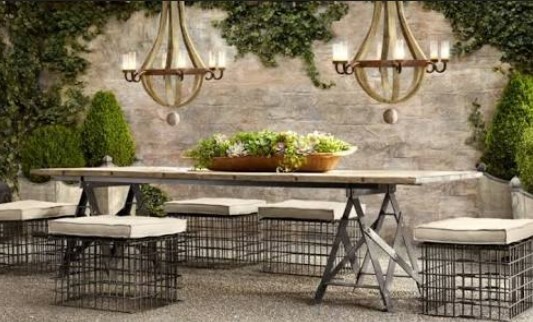 The chandeliers hanging above the table make the patio a romantic place. Don’t forget to add some plants for the natural touch. 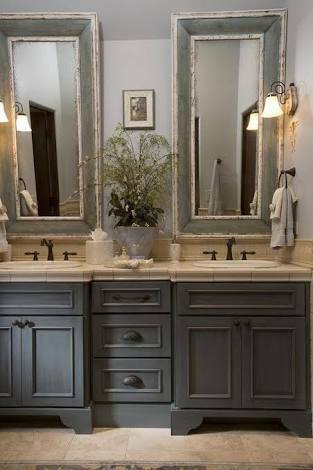 When you see this bathroom, you will instantly notice the rustic vanity and hugerectangular mirrors that resemble French country style a lot. They look so classic and elegant. The gray vanity plays an important role in creating this image. Natural stone tiles perfect the style. To freshen the look up, two mounted-lamps are added, creating a calming atmosphere with their dim light. And, again, a planter can make a pretty good adornment. Add a sepia photograph to provide a little bit vintage style. Finally, washing up inthis French country vanity is the best moment to invigorate yourself. Enjoy your leisure time by relaxing in your luxurious living room adopting French country style. The fabric sofas seem so inviting that you wish to lounge around while reading your favourite book. The red rug covering the tiles add lush look in the living room. As the focal point of this living room, an LED screen showing the image of dancing flame replaces the real fireplace very well. 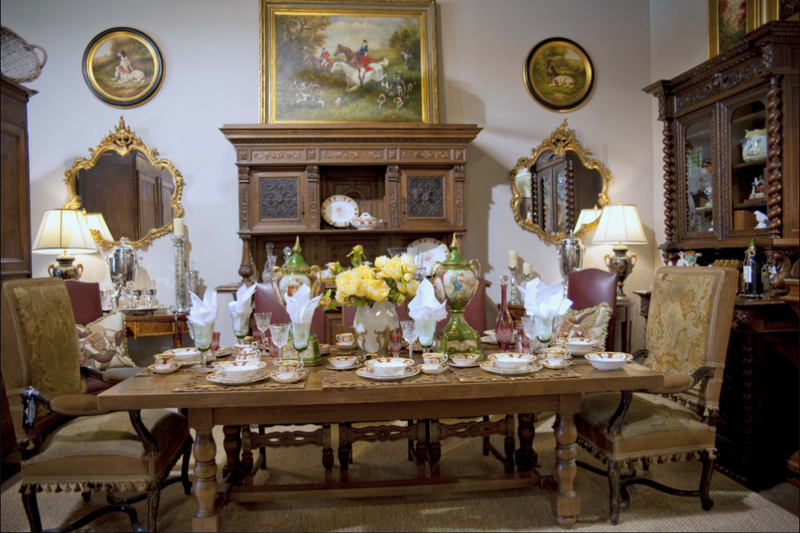 French country decor is a great way to give the touch of luxury in your house. Some furniture may cost an arm and a leg, but it does not mean you cannot afford this style. DIY projects or hunting some used furniture can help you salt away some money. « 10+ Stylish Covered Ceiling Ideas To Make It Smooth !